I have been asked over the years about the habits of Deer. Usually I am being asked by a hunter, who wants to improve their odds of a successful harvest. I always profess to not know much about them, because basically I think that is true. I have met other people that know more about deer habits and habitats then I ever will. That being said, I have had experiences with deer, always Doe, that make me wonder, how far removed these wild animals are from being friends with man. For those that don't know, a Doe is the female, deer. 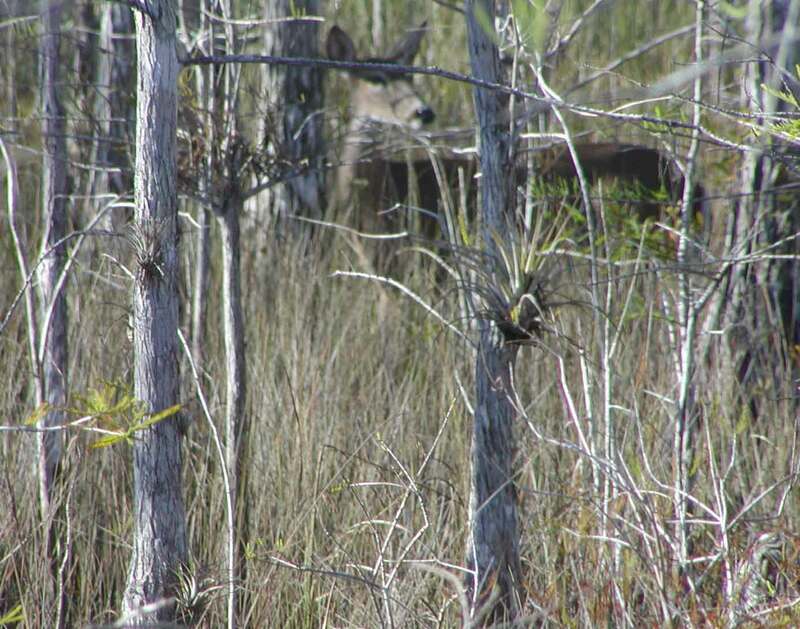 They are not suppose to be hunted in the Big Cypress Swamp and for that reason they behave differently then the Buck (male) Deer, which is hunted in the Big Cypress. I have to credit the Pinder's, old family friends, both Danny and his Father Fred, for my early exposure to deer, back in the 70's. They taught me a few tricks about deer in my younger years and I have used those tricks, whenever I have had the opportunity to "Walk with Doe". I am going to share those tricks with you, which is really "behavior", how you behave in the presence of deer. 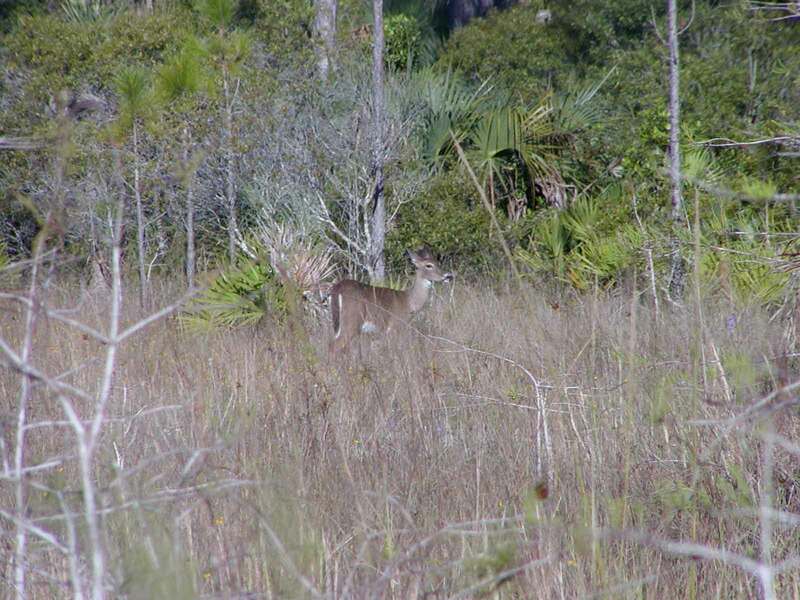 Big Cypress Doe has seen and accepted Me I will start by telling you, you will not walk within sight of a deer, and not have it see you first. A deer spends most of its time, watching and listening for predators that want to make a meal out of it. Man is one of its predators, like the panther is. Man is a clumsy buffoon, compared to a panther in the woods, and the deer is keyed to spotting a stealthy cat trying to slip up on it. Man doesn't have a chance of moving in the woods, without being spotted by deer first. Oh! occasionally it will happen, but rarely. So the key is "not, not being seen" by deer, the key is "not being seen as a threat", by the deer! A deer not seeing you as a threat, will some what depend on the mood it is in and how comfortable it is in its surroundings. If it is quietly browsing for food and does not see its surroundings as dangerous, then the situation is right for it to accept you as not being a danger. This is true, when there is one deer or more. 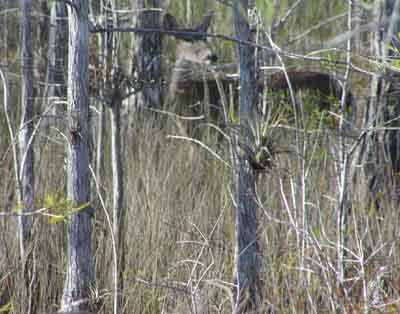 It is common for two Doe deer to be together. Some of the behavior that I am going to tell about. that you have to follow, is made more difficult by there being more then one deer involved. So lets start. 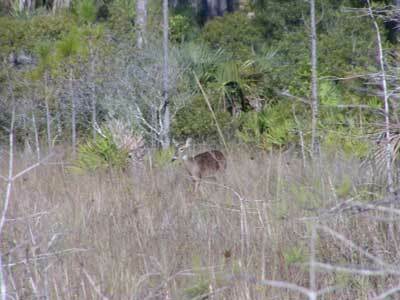 The first thing to do, when walking in the swamp and you see a deer is stop and don't move for a while. Most likely the deer is already looking at you. If you are more then a hundred feet away, then you can very slowly start moving again. Quietly and very slowly, one slow step at a time start walking again. You do not want the deer to hear your legs moving, no boot sloshing in the mud, no pants brushing against vegetation. Do not move your head, do not move your arms. Do not go directly at the deer, but about a 45 degree angle to the side of the deer. You must do every thing slowly. Also do not look directly at the deer, but watch it out of your peripheral vision. You want the deer to think you have not seen it, and are going to pass by. You can get pretty close to a deer this way, slowly circling around it. If the deer reacts to your movement, Stop! The deer has to accept you, before you can get any closer. If you are closer to the deer then a hundred feet, or it has not accepted you yet, then Don't move, don't turn your head, don't swat a mosquito, don't wiggle a finger or an ear. Just stand there until the deer starts looking away from you, or feeding again. Still don't move, the deer is going to look back at you, again and again. Its deciding if you are a threat or not. If the deer raises its tail, anywhere near or above horizontal, games over. It feels threatened and you might as well go back to tromping along through the swamp. The deer has accepted you, when it goes back to feeding and/or mostly ignoring you. It will still occasionally look back at you. Once the deer has accepted you, you can move, but in slow motion. You can slowly raise a camera and take a picture. You can slowly raise your arm and squash that mosquito that has been biting you on the neck. If the deer reacts to any movement, then stop. It is not fully comfortable with you yet. Wait until it returns to feeding or seems to be ignoring you, before moving again. The deer may after accepting you, move closer to you. I have had it happen several times. You may move closer to the deer, but only taking a slow quiet step when the deer is not looking at you. If the deer looks at you in mid step, freeze and don't finish the step until it looks away. You can not allow the deer to hear or see you move closer. It will accept you being closer, as long as it does not hear or see you moving closer. I have moved within twenty feet of a doe, doing this. You might imagine. this can be very time consuming. If you don't have the patience, don't try. If there is more then one deer, neither one of them can be allowed to see you move. The opportunities to move will be way less, because one of them will be glancing in your direction most of the time. I have been able to get the closest to single deer. Personal best, about eight feet to a yearling doe, at dusk. Yes, it was hunting season and I was carrying a shotgun. Its not seeing guns or people that scare them, its movement, footsteps and the noise of movement in the grass. 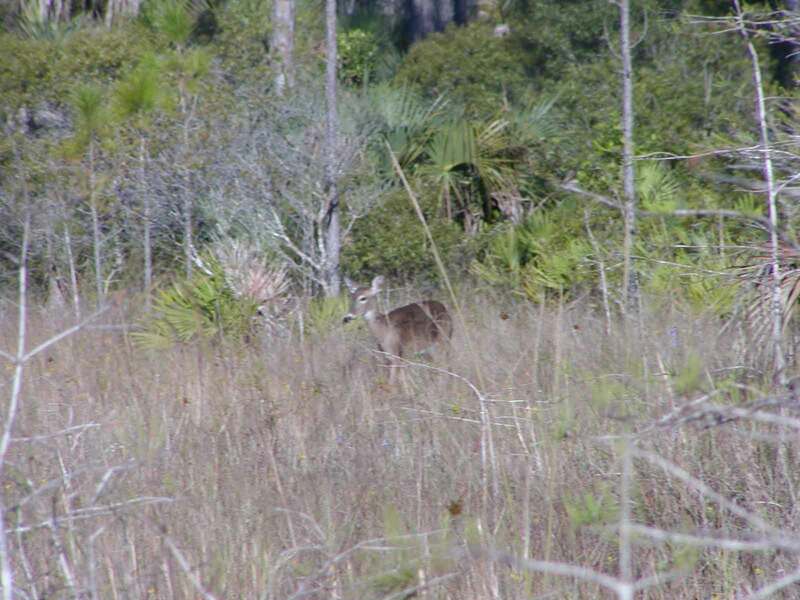 Big Cypress Doe has moved closer, about 15 feet away, She has accepted me as a non-threat and is more concerned about something else that made a noise. Is "Walking with Doe" for you? maybe not! For me interacting with the animal and nature is more of a challenge and exciting then sitting in a tree stand and watching the animal in the cross hairs of the scope. I hope that some day, I can learn to be so in tune with the deer and nature that I can get close enough to gently touch a wild deer on the hind quarter. That would be an ultimate thrill for me. For it to accept me doing that, would be unbelievable, and I don't think it will ever happen, but I will keep trying when the opportunity presents itself. 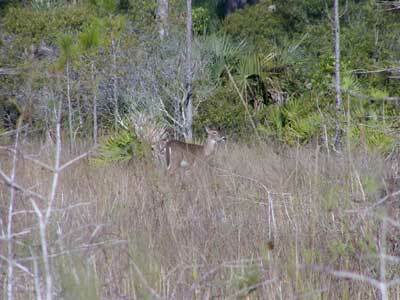 I have been in the swamps for many years, and the opportunities to "Walk with Doe" are too few and far between.